Entertainment chain CeX has announced today that it will open a new store at the Kennedy Centre in the run up to Christmas, creating ten jobs. The global brand was founded in London in 1992 and now has stores in the UK, Spain, USA, Ireland, India, Australia, Portugal, the Netherlands, Mexico and Poland. The chain buys, sells and exchanges a range of technology and entertainment products including mobile phones, video games, DVDs and Blu-ray movies, computers, digital electronics, TVs and monitors and music CDs. The new opening will see CeX taking 1,500 sq.ft. of space, the final available unit on the ground floor of the retail scheme. The Kennedy Centre has experienced a year on year increase in customers, averaging footfall of approximately 100,000 a week. Its anchor tenants include the largest supermarket in Northern Ireland, Sainsburys, as well as Iceland and Home Bargains. 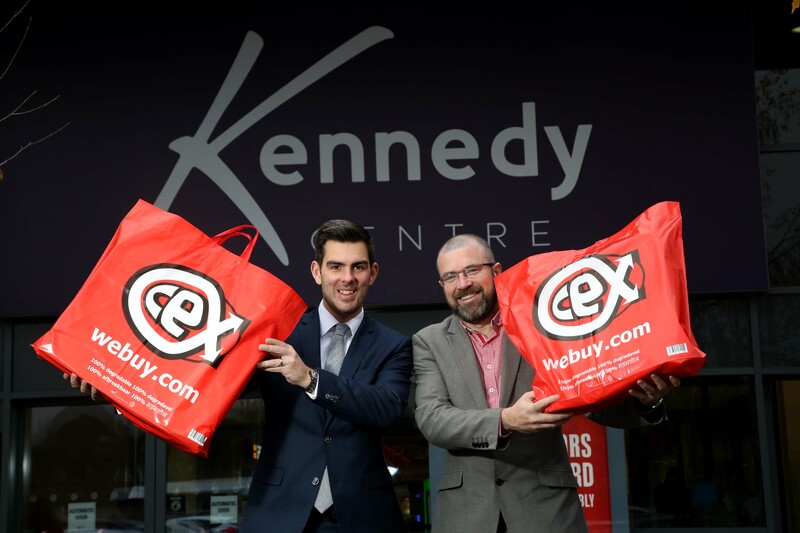 John Jones, centre manager for The Kennedy Centre, said: “We are looking forward to welcoming CeX to the centre, further improving our offer to our customers and creating ten new jobs for west Belfast. Lambert Smith Hampton acted on behalf of the landlord. Photo Caption: (L-R) is Ryan Kee, retail director at Lambert Smith Hampton, and John Jones, centre manager for The Kennedy Centre.